SUPERSPORT TOURING PERFECTION! 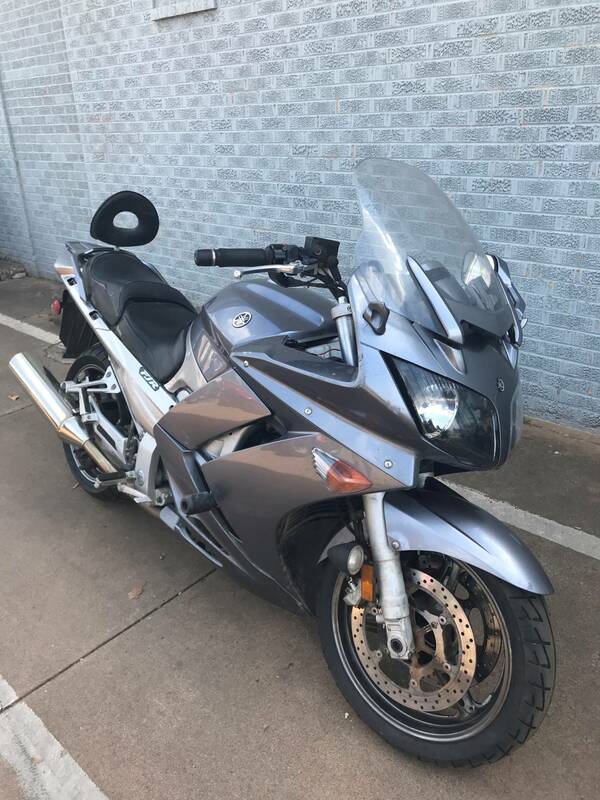 In addition to all the refinements for 2006, this FJR shifts with the touch of a finger, thanks to the all new electric-shift five-speed transmission. Super Sport touring has never been so smooth. Slimmer profile–reduced width by over one-inch for better maneuverability. Subframe-fitted quick-release luggage mounts provide easy use of the standard accessory hard side cases, which are conveniently matched to the ignition key. New instrument panel contains an electronic analog speedometer and tachometer; LCD digital odometer, dual tripmeters, gear position indicator, fuel, coolant and air temperature gauges, and clock; lights for neutral, high beam, turn signals, low oil and engine warnings—as well as real-time mileage, average mileage and air temperature. Sleek, cat-eye dual 12V 60/55-watt multi-reflector headlight throws an extremely broad beam for superb visibility. Compact, lightweight 1,298 cc, DOHC, 16-valve, liquid-cooled inline four-cylinder engine delivers massive power and torque (145 hp @ 8000 rpm and 99 ft.-lbs. of torque @ 7000 rpm, respectively) for an unequaled spread of muscle over a wide rpm range. Advanced fuel injection system is ideal for long-distance supersport-touring, delivering crisp, seamless throttle response in a variety of altitude/weather conditions. New, curved radiator and ducting with twin ring fans, insulated fuel tank, etc., for improved cooling. Shaft final drive system is super-durable and virtually maintenance-free. Low-vibration crankshaft with two gear-driven secondary counter balancers help deliver a glass-smooth ride with reduced rider/passenger fatigue. FJR1300AE receives, in addition to the other `06 refinements listed, heated grips and a Yamaha excusive electric-shift five-speed transmission that eliminates the clutch lever entirely—now you can click off supersmooth shifts using either the left bar-mounted paddles or the foot-operated gearshift lever. The world's first supersport touring bike gets a host of refinements—including standard ABS and adjustable ergonomics that widen the gap between it and common sport tourers to a gaping chasm. Advanced air management system and new bodywork, keep the FJR looking and feeling cool. Yamaha brings another industry first – a computer operated clutch and electronic shift actuators, eliminate the need to operate the clutch and improves shift effort. New sharper-looking bodywork and air-management system keep the bike and rider much cooler; a new central vent beneath the instrument panel now cools the rider and reduces negative pressure, and new fairing side panels with 1.2-inch adjustability let the rider direct airflow. New, curved radiator with revised ducting and twin-ring cooling fans keep engine and cockpit cool. A 1.3-inch longer swingarm provides even better ride and handling characteristics. A bigger windscreen is now adjustable over a wider range, for improved wind protection with reduced negative pressure. Taller overall secondary gearing reduces engine rpm for more comfortable long-distance cruising. New-design rear frame with integrated grab handle makes lifting the bike onto the center stand easier, and reduces overall width with bags mounted by an inch. Passenger footpegs are moved down nearly an inch, forward 1.5 inches and out 0.5 inch for more comfort. Redesigned instrument panel reflects the FJR1300's premium quality, and now includes real-time fuel mileage, average fuel mileage, air temp gauge and gear-position indicator. New headlights feature easy-access adjustment knobs; new mirrors are easy to adjust and retract horizontally. Revised throttle cable pulley gives lighter-action throttle pull. Glove box can now be opened whenever the key is in the On position, and contains a 12V outlet for phones, GPS units, electric vests, etc. An additional catalyst and a heated O2 sensor are located in the exhaust for increased control range and low emissions.